The Mooney Viscometer measures the change in a rubber and plastic elastomer properties over time, from uncured to scorched state. The specimen is physically deformed by a rotating platen which will determine changing viscosity at preset temperatures. When the test is completed, the dies will automatically reset and allow for removal of the specimen. With the PID temperature controller you can assure that smooth and accurate data will be taken throughout the test. The servo-driven motors contribute to very accurate results; they are also quiet and require no maintenance. This tester is designed for easy maintenance; it is equipped with modular electrical boards, quick detachable upper and lower dies, calibration via computer and auto hardware detect features. The unit is safe as it is equipped with a transparent arc shield. With our Mooney viscometer you can ensure reliable results at an affordable price. The Mooney Viscometer - QT-MVR3000 series is upgraded from the design of older traditional Mooney Viscometer machines. It adopts new microprocessor and LCD touchscreen, which have built-in automatic balance and calibration device. Just press one button to carry out calibration automatically. The plug-in mechanism enables quick cleaning of the rotor shaft. The crisscross head ensures it can center in the die cavity. 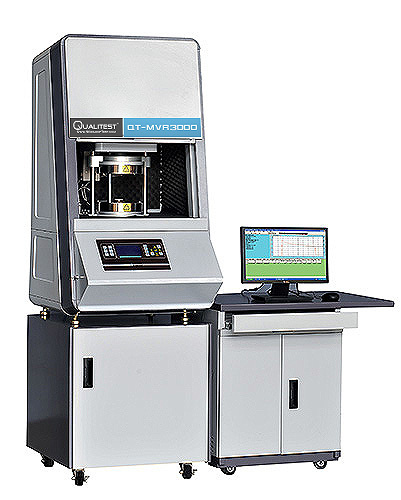 The Mooney Viscometer - QT-MVR3000 series has an accurate specimen temperature control system and precise torque measurement with high sensitivity to slight changes in rubber samples and better repeatability and reproducibility.